1/21/19 - Guest Appearance on Podcast "Right at the Fork"
5/3/18 - Guest Appearance on Podcast "Sips, Suds & Smokes"
1/31/18 - My Top 10 Travel Experiences of the Past Five Years, by Bex, a Food & Travel Blogger based in London. Thrilled to have Third Wave Coffee Tours listed alongside some epic bucket-list adventures! 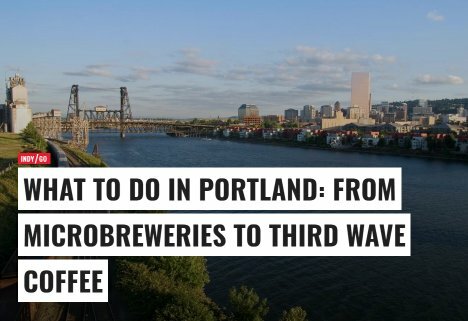 5/10/17 - What to do in Portland: From Microbreweries to Third Wave Coffee, by Laura Chubb, The Independent, London. Laura attended our Pioneering Eastside Roasters Tour in March 2017. 12/27/16 - This Life in Trips: Understanding Coffee Culture With Portland’s Third Wave Coffee Tours. Shaun Robertson attended our Pearl District Tour and wrote an excellent blog post about his experience. I highly recommend checking out his other travel blog posts as I've already used a number of his recommendations on my own personal travel. Global correspondent, Jon Marcus, interviewed me about Portland's coffee scene and the emergence of coffee tourism. Travel bloggers Tasha and Jarden from Hawaii came on our Downtown Portland Coffee Crawl and shared some pictures and stories of their journey. Food & Travel Blogger, Bex from London posted a gorgeous blog after attending our Streetcar Named Delicious Tour in February. From artisan coffee and farm-to-table cuisine to a long-standing cycling community, exploding crafts scene and the largest collection of microbreweries in the nation, Portland punches way above its weight when it comes to creativity, culture and livability. Third Wave Coffee Tours gets a mention as one of Portland’s best food and drink tours. 1/20/16- Beyond the hipster, food truck and “Keep Portland Weird” cliches, Oregon’s coffee-obsessed city has caffeine for every occasion. 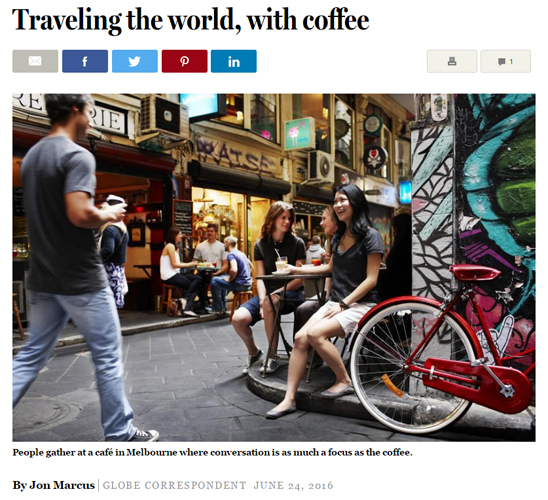 Travel Writer, Jo Stewart attend our Artisanal Donuts and Specialty Coffee Tour in November and developed this piece for the Herald Sun, Melbourne's largest newspaper. 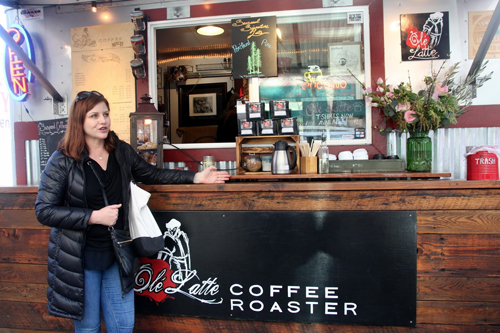 Blogger Tianna Gratta attended our Downtown Coffee Crawl on July 15, 2015 and wrote a nice piece about Portland's coffee scene. Blog post by Sally Thorpe, author of Chinese language blog "Sally's Garden". 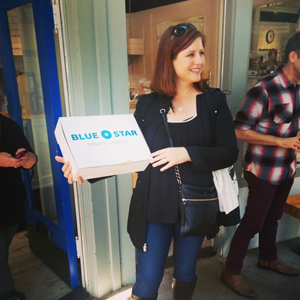 She attended the inaugural Artisanal Donut and Specialty Coffee Tour on May 14, 2015. 5/14/15- COFFEE AND DONUTS AND WRITERS, OH MY! Blog post by Seana Yee, author of the "Sherry Sips" blog. She attended the inaugural Artisanal Donut and Specialty Coffee Tour on May 14, 2015. 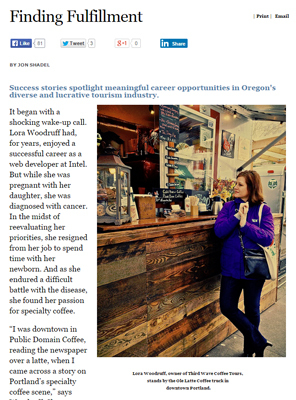 Third Wave Coffee Tour's founder, Lora Woodruff, is featured in an article called "Finding Fulfillment" about her jump from high tech to her true passion - tourism and coffee, of course. I was interviewed for a Japanese online magazine about the Portland coffee scene. 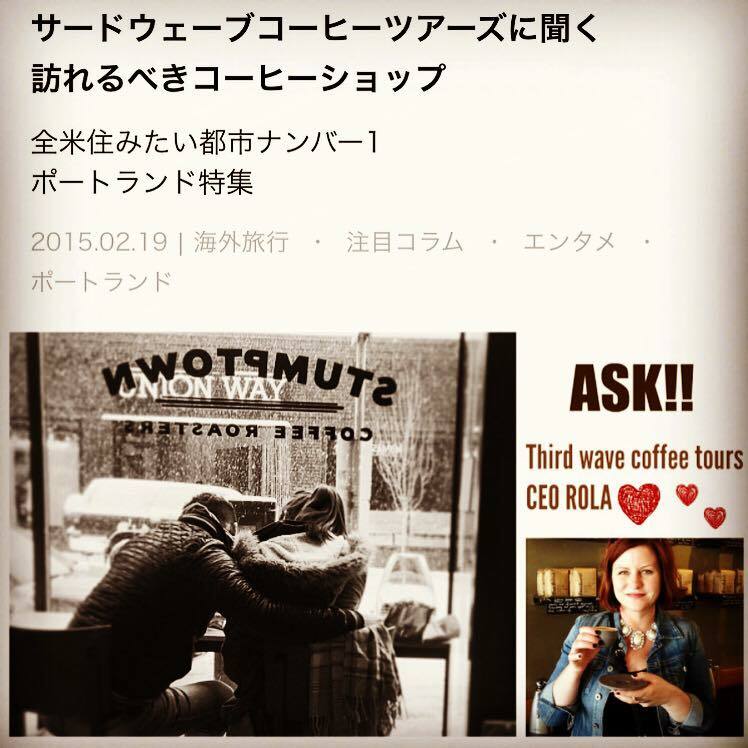 Third Wave Coffee Tours is featured on the Adventurefull blog. Razlyn Lysaught is traveling the country in search of adventure and the perfect cup of coffee in America's Top 10 Coffee Cities. Third Wave Coffee Tours is featured on Barista Magazine's blog with an article written by Jon Shadel who attended our Downtown/Pearl Tour on September 27, 2014. Third Wave Coffee Tours gets a mention in the October 2014 edition of Fresh Cup Magazine. Lora, an avid distance runner, and owner of Third Wave Coffee Tours, will be leading a 2.5 mile walk on Friday, 10/25 at 10:00 AM as part of Portland "Walktober PDX" - a non-profit organization that encourages exercise and fitness. The walk starts at Stumptown's Downtown location (128 SW 3rd) and goes through Downtown, the Pearl District and Northwest Portland, passing more than a dozen coffee roasters along the route. The walk ends at Case Study Coffee (802 SW 10th at Yamhill) where everyone will be treated to a hot cup of coffee. More information here. All are welcome! 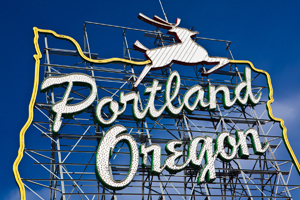 Tom Williams is exploring the coffee culture in Portland, Oregon. Sunrise is Australia's leading breakfast show. We took part in the Sunrise USA Road Trip series on Friday, September 5, 2014. 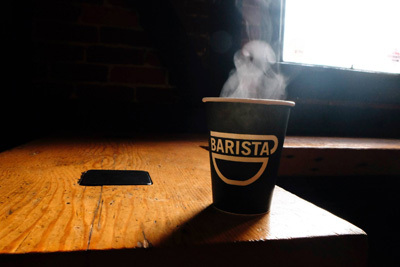 Article: 7 Artisanal Coffee Roasters to Visit in Portland - The Daily Meal, 8/7/14 by Teresa Tobat. Teresa came on the Downtown Portland Coffee Tour. 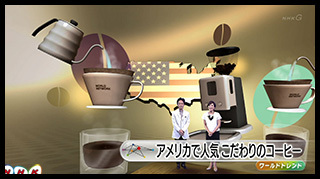 The Evolution of Coffee in America broadcast on NHK Japan on July 13, 2014. Third Wave Coffee Tours is featured in the first 1.5 minutes of this 8 minute news segment. 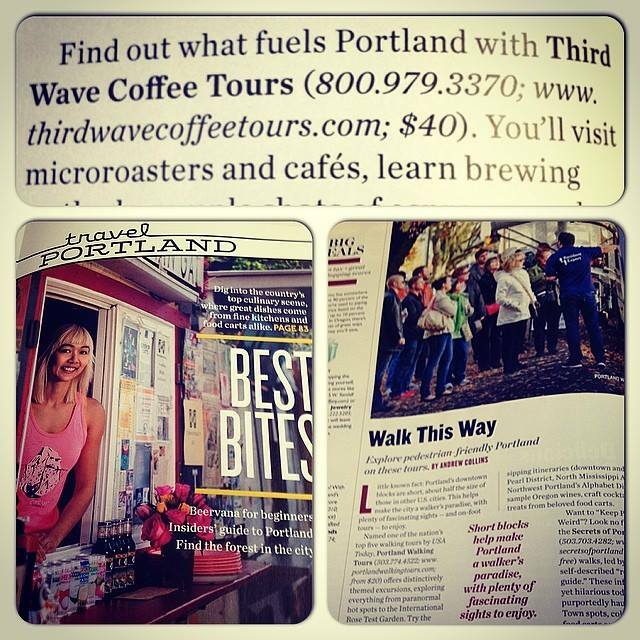 Third Wave Coffee Tours gets a mention in Travel Portland's Official Tourism Magazine, 2014-15. Sally的园子(Sally's Garden): 波特兰第三波咖啡之旅. 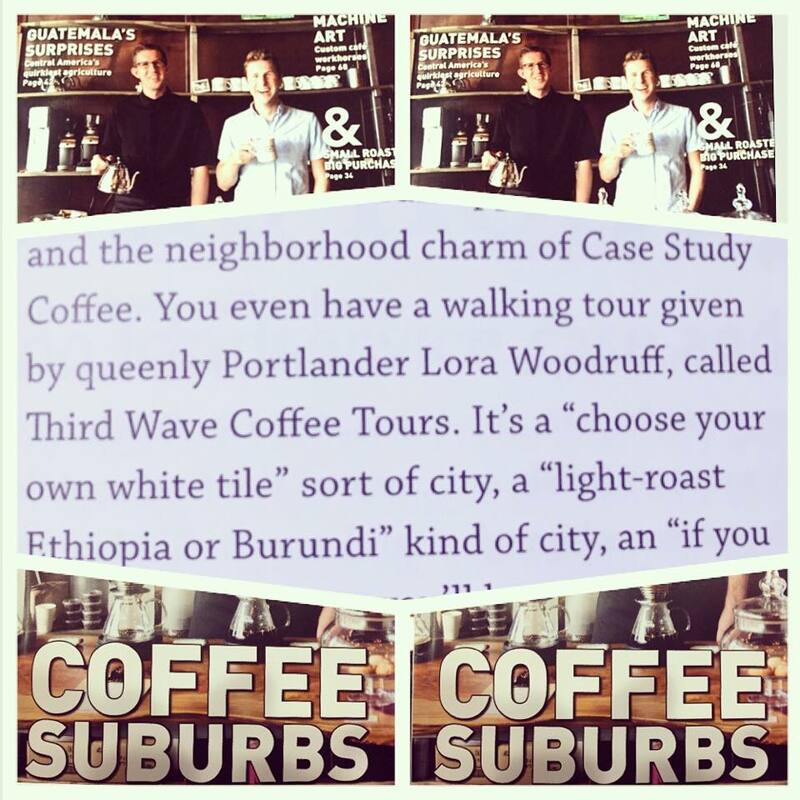 (Portland Third Wave Coffee Tour), 7/8/14 by Sally Zhou. 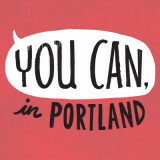 Sally writes a Chinese-language blog about life in Portland and Oregon and points of interest here. Sally came on our NW/Pearl Coffee Tour. 30 Day Adventures, 4/25/14 by Marc Smith. Marc was a guest on our Eastside Coffee Tour. He is a prominent blogger from Vancouver, Canada. Marc travels the world engaging in adventures and blogging about his experiences 30 days at a time. Caffeinated-PDX, 1/20/14 by Will Hutchens. He came on the NW/Pearl Coffee Tour. Will is the author of Caffeinated PDX: How Portland Became the Best Coffee City in America. Available on Amazon.com. Urban Bliss Life, 12/17/13 by Marlynn Schotland. She came on the NW/Pearl Coffee Tour. Living Big, 11/26/13 by Mary Cecchini. She came on the NW/Pearl Coffee Tour. Third Wave Coffee Tours is sponsoring a public cupping of Intelligentsia's Inmaculada Collection of Coffees on Tuesday, 2/18/14 at 12PM. Cupping to be held at Public Domain, 603 SW Alder Ave, Portland. PORTLAND, Ore. (Oct. 23, 2013) – Portland, Ore., has long been recognized as a coffee town, and this status received a further boost with the September launch of Third Wave Coffee Tours, a local company offering guided visits to some of the city’s best micro-roasters and coffee shops. The tours feature brewing demonstrations and tastings at four or five micro-roasters and conclude with a cupping, the international industry-standard practice for assessing the body, taste and aroma of coffee. 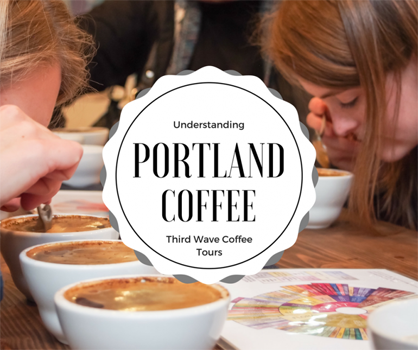 Third Wave Coffee Tours currently offers three walking tours, visiting micro-roasters and coffee shops in Northwest Portland and the Pearl District, downtown, and in Southeast Portland, as well as a streetcar tour that covers a broader geographic area. A running tour is available through City Running Tours, and personalized private tours can also be arranged. Standard tours last two and a half to three hours and cost $40 per person. Advance registration is required. Tickets can be booked online or by phone at 503-446-1912. Gift certificates are available. 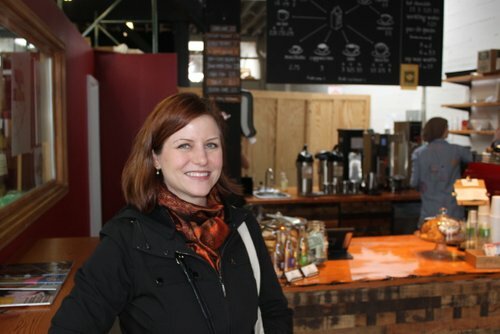 Third Wave Coffee Tours was founded in 2013 by Lora Woodruff, a second-generation Oregonian with a passion for sharing the best of Portland with others. Third Wave offers a variety of tour options, most of which feature brewing demonstrations and tastings at four or five micro-roasters and conclude with a cupping. The company takes its name from the “third wave coffee” movement, which treats coffee as a complex artisanal product. While first wave coffee culture viewed coffee as a commodity, and the second wave saw the explosion of espresso drinks and regionally sourced coffee beans, third wave micro-roasters make distinctive, high-quality coffee by sourcing beans from specific farms and roasting them to bring out the unique characteristics of each type of bean, as well as paying close attention to the physics involved in brewing the perfect cup. For more information, visit www.thirdwavecoffeetours.com.